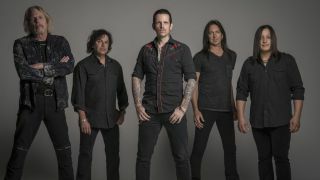 Black Star Riders have given further details on their third album Heavy Fire. They previously announced the title along with a UK and Ireland tour which will take place in March 2017 – now the band have revealed that the follow-up to 2015’s The Killer Instinct will launch on February 3. See the full tracklist and album cover art below. Guitarist Scott Gorham adds: “Not many new bands get to record three albums these days. Without doubt this is Black Star Riders’ best album so far. Heavy Fire was produced by Nick Raskulinecz and it’ll be released via Nuclear Blast. It’s available for pre-order.